Weathering is a process that breaks down exposed stone and rock, causing it to split apart or wear away. Weathering leads to erosion, where particles of broken rock are carried away and deposited elsewhere. 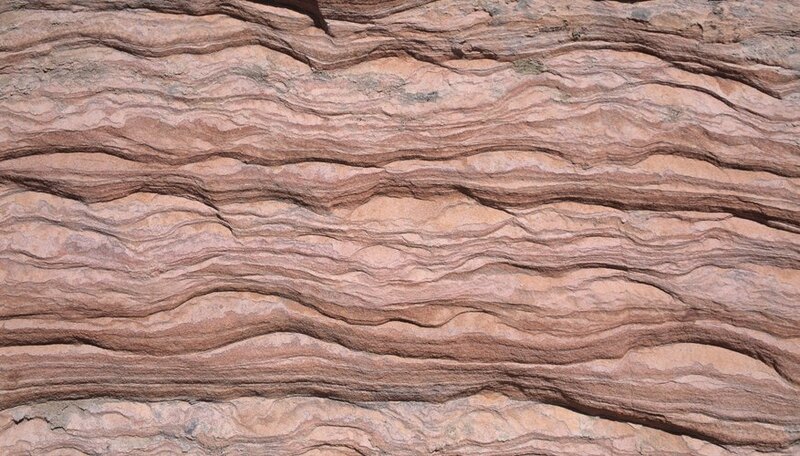 Different forces can cause rocks to become weathered: Physical weathering is caused by purely mechanical changes to the rock, while chemical weathering is caused by chemical reactions. Physical weathering, sometimes called mechanical weathering, refers to processes that break down the structure of rock without changing its components. One common way this occurs is wedging. Water flows into holes and cracks in the rock, then freezes. When water freezes, it expands, causing the holes to grow larger. Salt wedging occurs when seawater in these cracks evaporates, leaving salt deposits behind that press outward on the rock. Plants may also cause wedging; plant roots can also grow into these holes and cracks and exert pressure on rock. Over time, the pressure exerting by wedging will expand gaps and cracks in the rock until large sections of the rock split apart completely. Abrasion is another form of physical weathering that causes rock to deteriorate over time. Abrasion is the reason that rocks on a riverbed are typically smooth and rounded. As water in the stream flows, it causes rocks to collide with one another, wearing off any rough edges. Wind can also aid in abrasion. Tiny particles of dust and rock in the wind can collide with exposed rock, smoothing down rock faces over millions of years. Another form of physical weathering is exfoliation. Many rocks form deep underground, under forces of extreme pressure. When erosion or shifting glaciers reveal these rocks, the lack of pressure causes the top of the rocks to split apart into smaller sheets. Chemical weathering does not cause physical damage to rock but rather is a reaction between the chemical composition of the rock and outside chemicals. Chemical weathering can make a rock more vulnerable to physical weathering forces. For instance, oxidation is a process by which oxygen in the air reacts to chemicals in the rock. Iron in rocks can react with oxygen to form iron oxide, or rust. Rust is weaker than iron and makes the rock more likely to degrade. Hydration is a reaction in which molecules of water are incorporated into the structure of a rock. For instance, hydration causes the mineral anhydrate to convert into gypsum, a less dense mineral that is more vulnerable to outside physical weathering forces. One of the best-known forms of chemical weathering is acid rain. Acid rain forms when industrial chemicals are converted to acids by reacting with water and oxygen in the atmosphere. Sulfur dioxide, SO2, converts into sulfuric acid, and nitrogen compounds turn into nitric acid. Carbon dioxide in the atmosphere may also be converted into carbonic acid. These acids then fall to earth as rain. Acids react with rock and strip away essential chemicals from the structure of minerals that rocks are made of. Acids are particularly effective at removing calcium from minerals; because calcium is an important part of limestone and marble, acid rain causes significant damage to sculptures and buildings made of these materials. Zamboni, Jon. "Physical & Chemical Weathering." Sciencing, https://sciencing.com/physical-chemical-weathering-6468611.html. 25 April 2017.